After you buy your barrel prospect, ride him as much as you can to get him in shape if he is not in shape. I recommend that you stay away from barrels the first couple times you ride because you want to get a good feel for your horse and how he reacts to things, Take him on trails and get him used to his new home and new field mates. Make sure he is fully listening to you because this will heavily impact your ability to train him. Please note: I will go in greater detail about how to actually practice the pattern later on. This is all about your planning aspect of training. After you are used to your new prospect you can start thinking about your plans to train him. I recommend having a set schedule of your training. Do barrel work with your horse 4 times a week at a walk for the first month an on the other 3 days of the week do other fun things with him like trails riding with friends. Keep his mind calm at all times of training to ensure that he doesn't become one of those hot headed horses who do not listen. After a month of walking the pattern 4 times a week, give him about a month or so off form barrels. Take him on trails or do team penning with him but do not do barrel work. This will make sure he does not start to hate barrel racing. After your horse has a month or so off then bring him back to walking the pattern and make sure he remember everything you did before. Remember that horses are routine animals so make sure you are doing the pattern the same every time. 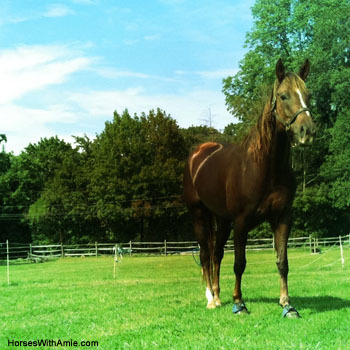 After you feel like you horse knows the pattern at a walk them push him up to a trot. Do this for about a month just like you did at a walk, 4 times a week and go on trails the other 3 days. After a month of trotting give him a month or so off from barrel racing and ride him without any barrel work. Bring him back to trotting the pattern after about a month off and if he still has retained him trotting and walking work than see what he can do at a canter. Use the same schedule before, barrel work 4 times a week and other riding the other 3 days. Cantering the pattern will require more than one month to master before you want to move him on but at this point it is based on how your horse is doing and how fast he learns.